An Unofficial Peek at the WMS New Eggs! I've got an unofficial WMS sneak peek for you! Bonnie and Laurie are the official sneak peekers today so be sure to check out their wonderful creations! 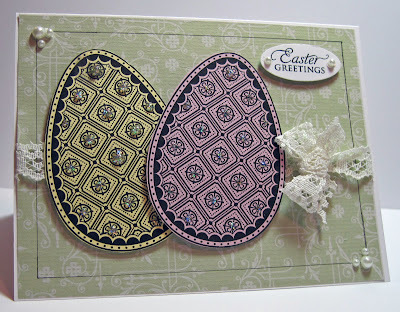 My beautiful egg stamps and sentiment are a sneak peek of a Waltzingmouse Egg Set that will be available on Monday March 1. And another fun surprise!! The designer paper is a brand new digital DP that Claire will have available on March 1 also. 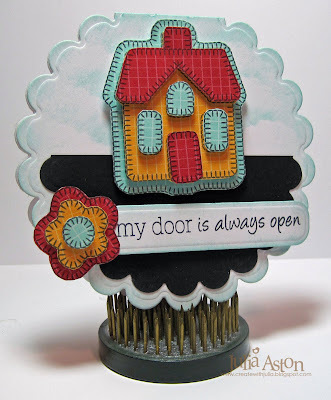 Notice how the design matches the stamps in Faux Fun Circles and Vintage Circles Small??? 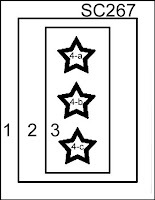 One of the little eggs in the new Egg set has this pattern on it also - Whoo Hoo - how matchey matchey!?!?! To finish off my card - I used a micron pen to draw an outline, added sticky pearls to the corners and gold stickles to the eggs. Now go check out Bonnie, Laurie and our Claire! Yippee! it's almost the weekend! Be sure to come by on Monday 3/1 - the WMS DT will be having a New Release Blog hop and like last month - there will be stamp sets to be won!!! A Clean and Simple Spring! Yes- I think we are ALL ready for warm weather right about now... and the Clean and Simple challenge on Split Coast last week was Wishing for Spring! 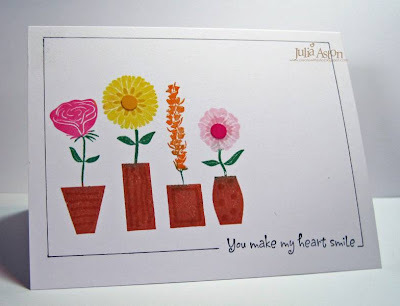 I used several colors of Memento Tear Drop ink pads to ink up my flower stamp (all four potted flowers are on one stamp!). Then I used a brown copic to make little lines on the pots to give a little depth and a yellow and pink copic to darken the center on two of the flowers. I also used the circle from a punch for their centers. I drew a line around the edge of my card with a Micron pen just to define the space. It's amazing how that little line adds so much don't you think? 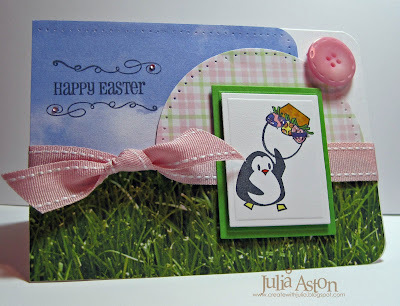 Although my card says 'Spring'! outside my house still says "WINTER" but the snow is melting a little bit each day! I'm so happy to see you here today! Tomorrow I'll be having a sneak peek of a new Waltzingmouse stamp set coming out on March 1st so be sure to come by to check it out!! 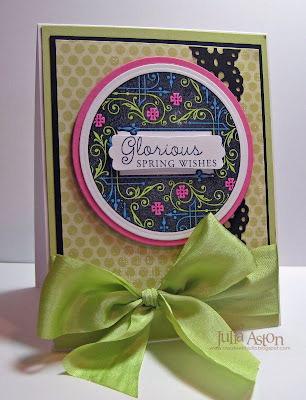 WMS Customer Blog Hop - The Theme is Spring! 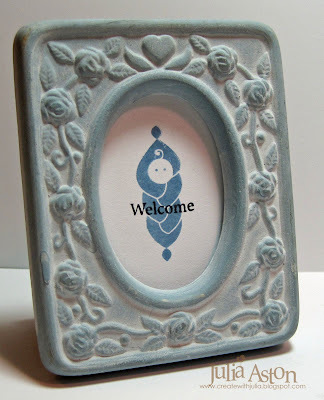 Welcome to the Waltzingmouse Customer Spring themed Blog Hop! If you want to start with the first person on the hop - check out Angela here. If you get lost - you'll find links to all 52 participants on Claire's blog here. Today I used Claire's wonderful Spring Baskets Template for my project - isn't it just divine?!?!! I stamped the zig zag from Off Beat Backgrounds around the top piece of the basket. Then I added this pretty narrow lace around all the joinings. I white embossed one of the lacey stamps from Vintage Circles on a scalloped circle that I attached to the bottom of the basket. 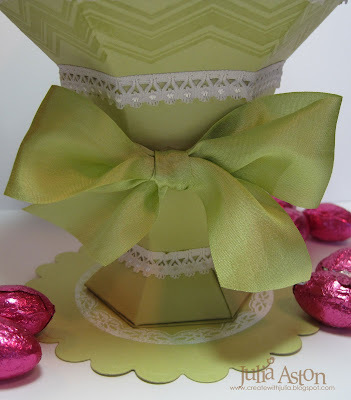 Finally I tied this soft as butter silk ribbon around the column and added the basket shred and yummy Lindt gold wrapped chocolate bunny to top it off! Miss Bunny came with a bright red ribbon around her neck - so I swapped it out for this soft pink chennile one! We hope you'll leave some love along the way as you hop to let everyone know you've enjoyed this glimpse into spring time! Next stop on the hop is Jennifer! I very rarely, if ever (! ), use orange - but that was the Ways to Use It challenge on Split Coast this week - and I guess that's what challenges are for right??!! to make you do something you don't usually do! And it sure does pack a punch doesn't it?!?! I made one of these wonderful layered flowers with an orange flowered DP from PTI. After I got the flower together I realized that the white on the back of the DP showed here and there so I sponged it a little with orange ink. 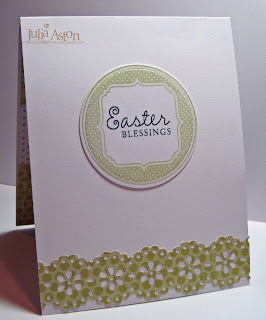 I dry embossed a nestie frame in the middle of the panel then embossed this pretty basket from the Spring Baskets set by Waltzingmouse Stamps using white embossing powder. I clustered the sticky pearls in the corners then connected them with a white gel pen. I sponged the edges and over the embossed frame a little with tea dye distress ink just to tone it down a little bit. 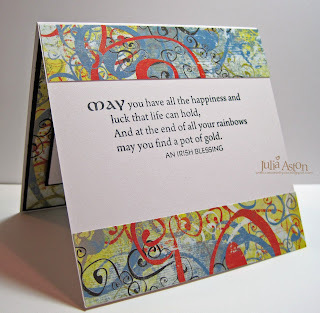 This is also for an inspiration challenge I found over at the Stamping Around blog. I was inspired by the basket of pretty roses. Are you planning on joining in on the Waltzingmouse Blog hop on Monday? If you are - hop on over right now to sign up on Mr. Linky!! Saw It, Loved It, Bought It! I chose this masculine sympathy card . I changed the colors, used different stamps and made it a happy shopping card! I used the pinking circle nestabilities to frame my circles - I love the PUNCH it adds! I paper pierced the circles and white embossed the images. Then added a little bling around the sentiment which says "Saw It, Loved It, Bought It!" 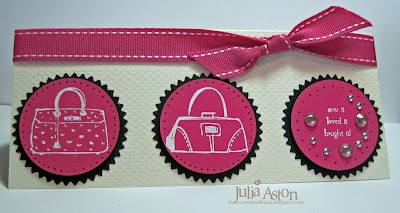 The stamps are Fashion Icon #455 from Rubbernecker Stamps and they are SO fun! check out the shoes, bags and hats! Anyone up for going to the Mall?!?!? Fun alert!!!! : what are you doin' on Monday 2/22??? 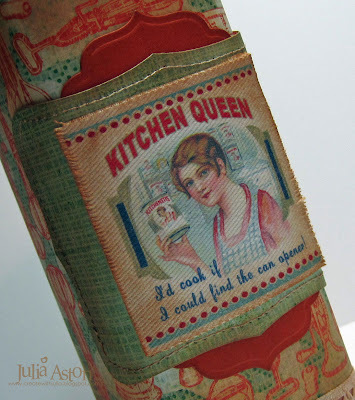 How about joining in on the Waltzingmouse Customer Blog hop!!! check it out here or on my side bar (click on the picture). AND - Claire has just added Tempting Templates to her store - whoo hoo!!! 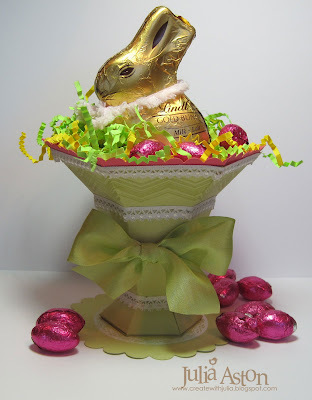 - the first being a wonderful Easter Basket that can be made short or tall - it's just the sweetest thing! and the best thing is that you order it and 'bing' you have it right away as a download and can start creating!! Are you as in love with Mo's Digital Pencil images as I am??? 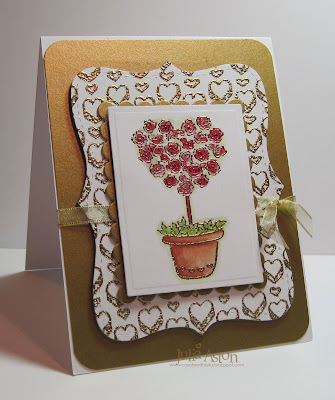 They have some fun challenges over at their blog and this weeks Challenge #18 is a color challenge - to use pink, white, red and include a heart. 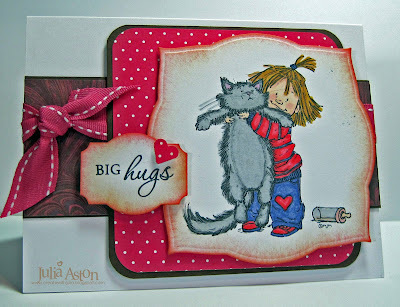 This is Patience on my card today - she loves her kitty SO much - she just wants to pick her up and squeeze her!!! I want to squeeze both of them!! LOL!! The sketch is Karen Giron's and I used my Labels Three nestabilities to cut out the image. The sentiment is from Sweet Hearts by Waltzingmouse. 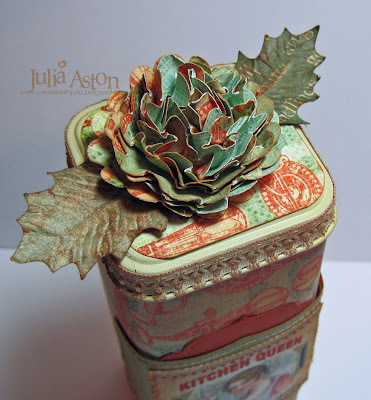 Green Hugs and Kisses and A Stamp Set Won! Bar was the Featured Stamper over on Split Coast this week. What lovely cards she has in her gallery! There were several I thought I might CASE but I finally chose this pretty Heart Flop Card . I changed the stamps, colors, placement of the heart, and used ribbon instead of buttons but you can see her nice design and general theme on my card. The sugar heart and hugs and kisses sentiment are from Rubbernecker Stamps I love the font on this sentiment - don't you?! And check this out! I participated in the "Who's that Bear" challenge over at The Cat's Pajamas, suggesting his name be PJ Bear - and I was one of the winners! Unfortunately I didn't win free stamps for a year :( but I DID win the A Beary Good Year set! Woo Hoo!!! Look how cute this seasonal set is - with accessories for all kinds of celebrations and holidays! Thanks for coming by today! We're suppposed to get 8" of snow today - a good reason to stay in tonight and stamp!! 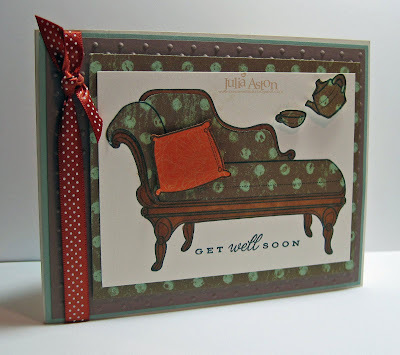 I'm multi-challenging again - my card today is for theSplit Coast color challenge, da Mudder's Teapot Challenge, Hostess Joan's Doubledog Dare Challenge to make a get well card, and I used Mercy's Tuesday Sketch! The chaise is paper pieced and the wood part is colored with a copic. The teapot, cup and pillow are up on foam dimensionals. WMS Blog Hop Winners Announced! Just popping in to let you know that Claire has posted the winners of last week's Waltzingmouse Blog hop - check to see if you were a winner here! Claire and all the DT are so appreciative of all your wonderful comments on our cards!!! Thanks so much for Blog hopping with us! Hi everyone! Moonbeam and I are on our way to visit Curt the cow to add our 2 cents in about what we think the little guy-cow should do career-wise. What are our 2 cents you ask - yes - we heard you ask that question......Well - Moonbeam, first of all wants to show Curt the proper way to sit on the moon - she is displaying the proper stance on our card here - and 2nd - we both want to encourage Curt to do what ever it is that makes him happy - and allows him to 'SHINE'!!!! I used Mercy's tuesday sketch on my card today.See you all in Hollywood ladies!!! Save me some moonshine - ummmmm - I mean tea!!! 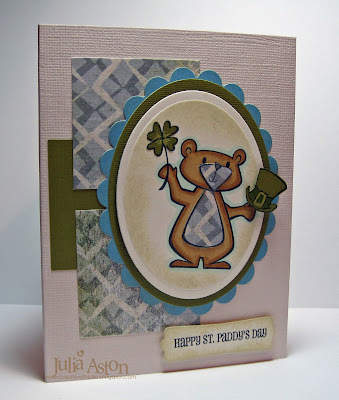 You can still get in on the chance to win two Waltzingmouse stamp sets - You have until tonight (2/7) at 11:59 pm EST to leave your comments - check out the start of the blog hop here!! 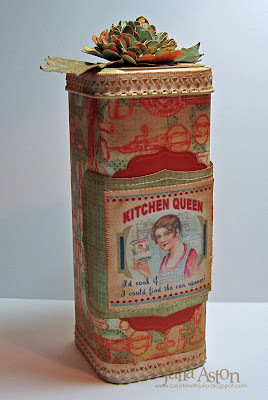 I just love these little bucket purses of Mel's. Making one of these was the Try a New Technique challenge over at Split Coast this week. I made mine out of designer paper. I also made this beautiful flower out of the same DP. You can find the tutorial for the flower here on Mercy's blog. I cut the stem with a sizzix die from the same DP (back side). The sentiment is from Say it With Style and the frame is from Very Vintage Labels No 4 - both from Waltzingmouse Stamps All the frames in the set fit Labels Four Nestabilities. 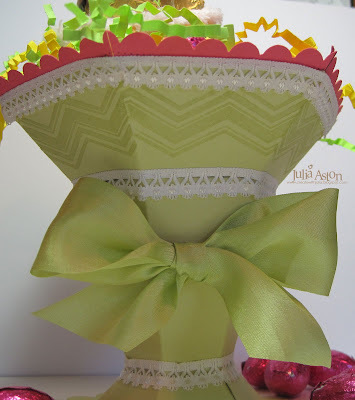 I am the hostess for the Doubledog Dare Challenge on Split Coast this week and this is my challenge - to make one of these great flowers and use it on a card or project. No scallop circle punch or die??? -you can make any kind of layered flower - it just can't be a pre-made flower - ok?! We hope you'll join along with the DDC challenges - just put DDC in the keywords when you load your project on Split Coast! The flowers are really easy to make and they come out great - I hope you give them a try! 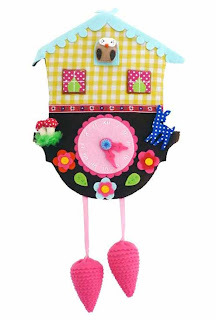 Wouldn't this make a nice little Birthday present holder for someone?!? Reminder: Claire is previewing 4 new stamp sets this week until the release on Thursday - so check out her blog - she'll tell you which DT members are doing previews! 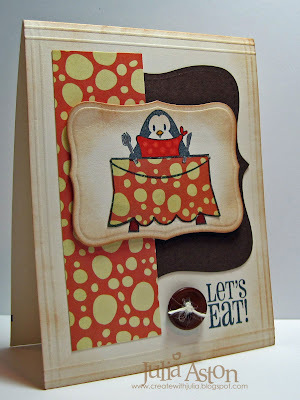 And we're having a fun blog hop on Thursday afternoon when the sets are released and there are stamp sets to be won!!! so be sure to come by then! 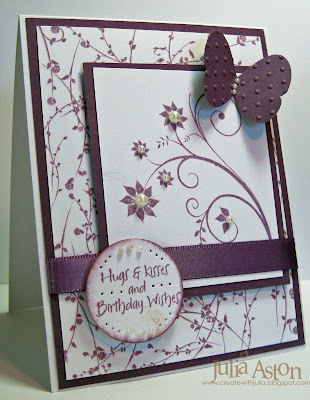 This week Nichole (butterfly ears) was the featured stamper over on Split Coast. 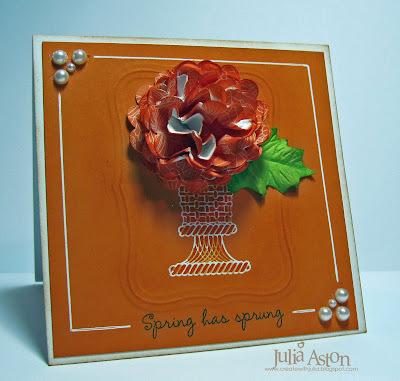 I cased her pretty fruity Friday topiary card . I knew this roses topiary from Rubbernecker Stamps would be perfect as a substitute for her fruit tree. I embossed both the topiary and the hearts background with gold EP. I colored the image with Copics. I used the Top Note die to cut the hearts background. Several of the layers are up on foam dimensionals. Doesn't the gold card stock set it all off nicely? Under Fun News: Cindy Motherway (AKA Mothermark and da Mudder of teapot Tuesday fame on SCS) is joining us on the Rubbernecker Design team- Whoo Hoo!! h0w fun is that! Welcome to the team GF! Reminder: Don't forget to come back on Thursday afternoon for the Waltzingmouse Blog Hop! there will be two stamp sets up for grabs!!! Be sure to check out Claire's blog - she'll be having sneak peeks everyday until the release and will also be letting you know which DT members are posting more sneak peeks! Faith Is...... a Waltzingmouse Sneak Peek! I'm so excited about Claire's 4 new Waltzingmouse sets coming out this Thursday that I had to make 2 sneak peeks for you today! I've used stamps from 2 of the new sets as well as some images from older sets so I'll identify where they come from as we go along! Don't you just LOVE the detail on this beautiful basket? I colored it with 3 different shades of brown copics so you could see the intricate design on it! 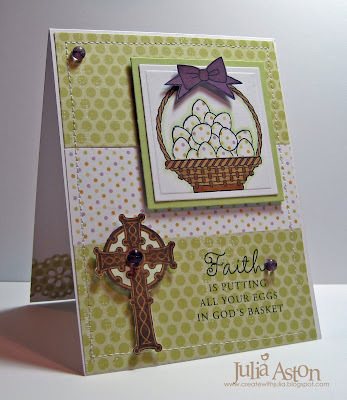 This new set called Spring Baskets comes with several different 'things' you can put in your basket - I used the eggs today (which I paper pieced) since it went along with the sentiment I chose - 'Faith is putting all your eggs in God's basket' - isn't that a wonderful thought?! 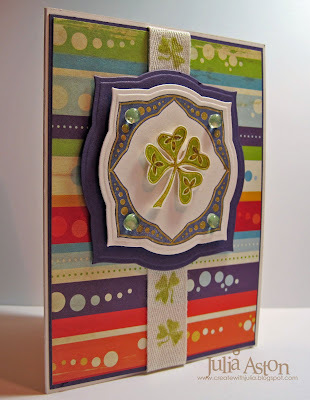 The lovely Celtic Cross is from an older set called Celtic Heritage. I stamped it in brown and then colored the pattern in with a lighter brown Copic. I stitched around the edges of my card with my Janome sewing machine. I used Taylor's sketch for my design. 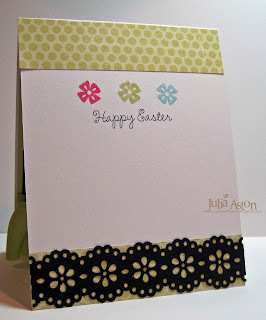 On the inside of my card I used a wonderful circle stamp from one of the new sets called Vintage Circles Small. The sentiment is from the new Spring Baskets set. I made the lacey panel using a Martha Stewart punch I just got. 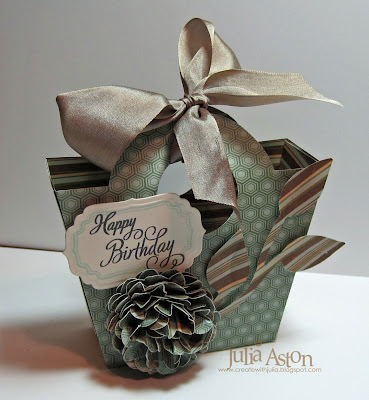 This Basic Grey designer paper (Cupcake) is so fun for party cards! 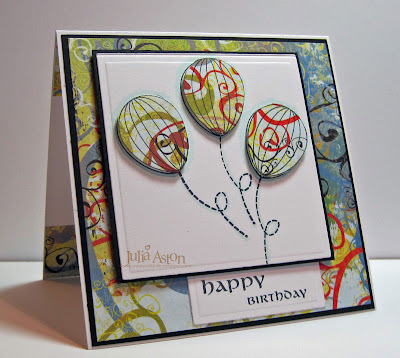 I paper pieced the 'balloons' popping them up on foam dimensionals and outlined the strings and balloons with a very light blue copic (BG10) The sentiment is from an older set Celtic Heritage. I think this makes a great masculine card, don't you?!? Fun but not too accessorized!!! 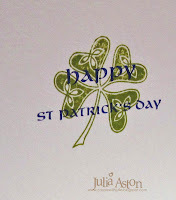 On the inside of this card - I adhered a 1" panel of designer paper to the top and bottom - stamping this verse from the older set Irish Blessings in the middle - leaving some room beneath for my salutation! I hope you have enjoyed my sneak peeks and that they have inspired you! Starting yesterday (did you miss it?!?) two DT members are showing sneak peeks every day until the reveal on Thursday -check my side bar for links to the DT's blogs! The new sets will be revealed on Thursday 2/4 over at Waltzingmouse and that same day we will be having a blog hop with PRIZES to be won!! So be sure to check back! 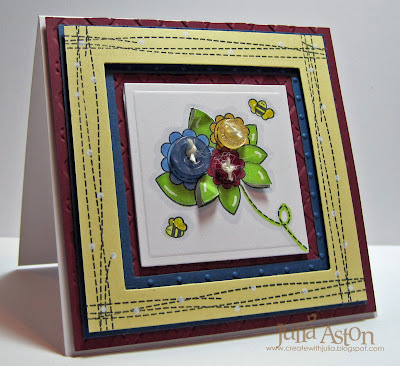 Anya is also doing a sneak peek today so please hop over to see what she has to inspire us! And be sure to check Claire's blog too - she'll be showing new creations every day until the reveal on Thursday afternoon!